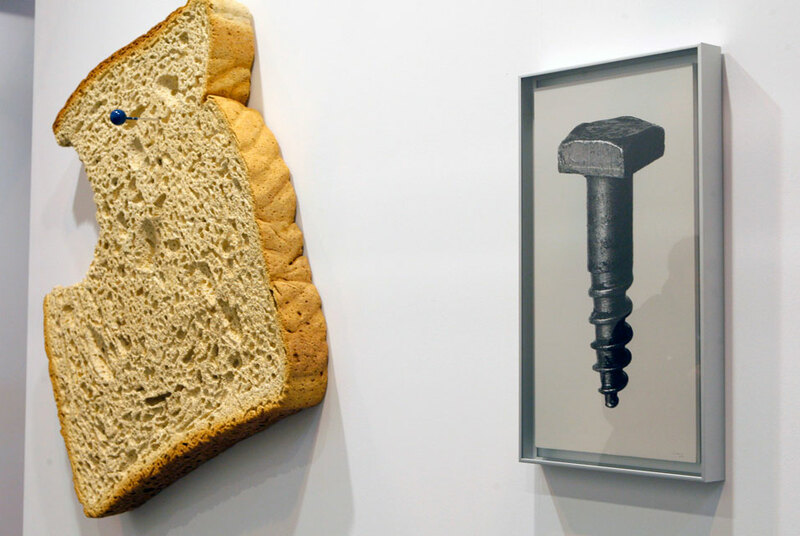 The art works entitled 'Reality bites' (L) and 'Zoom 12', (R), by Spanish artist Romulo Celdran are displayed at Raquel Ponce gallery stand in the 30th International Contemporary Art Fair, (ARCO), at Ifema fair, in Madrid, central Spain, 15 February 2011. ARCO runs from 16 February 2011 until 20 February 2011. With a number of 197 galleries taking part this year, 2011 edition has a special focus on Russia. EPA/GUSTAVO CUEVAS. MADRID.- ARCOmadrid opens its doors on February 16th to art world professionals from noon to 9 pm, who can now get their passes to the fair online in the Request for Professional Access section on our web. After two professional preview days, the fair opens to the general public on Friday 18th until Sunday 20th, from noon to 8 pm. The public can also get their tickets online. Vouchers for RENFE (trains) and IBERIA (airline) offering discounts on tickets between 30% and 50% can also be downloaded. Anyone interested in knowing more about the upcoming fair can find what they are looking for in INFOARCO, also available on our web. INFOARCO contains details of how to get there, admission, galleries, the different sections, awards, prizes, etc. plus lots of useful information on Madrid and what's happening artwise in the city during the fair. At the same time, this coming February 9th, ARCOmadrid is launching its application for iPhone and iPad, downloadable from iTunes. The art fair revolves around its core General Programme & ARCO 40 section with 161 galleries from 21 countries. Mixed in among this section are eight galleries selected by Daria Pyrkina, curator of the National Centre for Contemporary Arts and a professor at the Lomonosov Moscow State University, for the FOCUS RUSSIA programme which also hosts major Russian institutions such as Ekaterina Cultural Foundation; Garage Centre for Contemporary Culture; MMOMA Moscow Museum of Modern Art; Multimedia Art Museum; NCCA National Centre for Contemporary Art; Permm Museum of Contemporary Art; State Hermitage Museum; Stella Art Foundation; Victoria Foundation; and Winzavod, as well as an exciting programme of Russian collectors. At the same time, the SOLO PROJECTS: FOCUS LATIN AMERICA section, open to emerging Latin American artists, will be represented by 13 galleries chosen by the Brazilian freelance curator Luisa Duarte; the associate curator at Museo Tamayo, Mexico City, Daniela Pérez; and Julieta González, associate curator of Latin American Art at Tate Modern, London. Meanwhile, the OPENING: YOUNG EUROPEAN GALLERIES section will feature 19 young galleries selected by the freelance curator and gallerist Maribel López. Besides the works on exhibit at the booths, the fair is also hosting its usual debates with renowned art world professionals, intellectuals, artists, philosophers and foundations who will be debating issues of interest in various roundtables and meetings. On one hand, the Forum features a range of panel debates focused on Russia, directed by Daria Pyrkina, and others on Collecting, directed by Rosa Martínez, director of the 51st Venice Biennale. On the other hand, there are six Professional Encounters with Chus Martínez, chief curator at MACBA Barcelona; Latitudes, the independent curatorial office founded by Mariana Cánepa and Max Andrews; Marta Gili, Director of Jeu de Paume, Paris; Adriano Pedrosa, freelance curator from Barcelona, Hans Ulrich Obrist, Co-Director of Exhibitions and Programmes and Director of International Projects, Serpentine Gallery, London; and Lynne Cooke, Deputy director for Conservation, Research and Outreach at Museo Nacional Centro de Arte Reina Sofía, (MNCARS), Madrid. The International Collectors Programme is one of the fair's major driving forces. Through it ARCOmadrid invites a select group of 150 international collectors. They will be accompanied at the fair by representatives from museums and institutions such as Maison Rouge from Paris or the Association of Collectors of Portugal, among others, as well as major Spanish collectors, plus a large number of young collectors.